This is the old news page of the website from two generations ago, left here for reference. This page and its links are not updated. The current website is here. The current news page is here. You can download Star One “Victims of the Modern Age” wallpapers here. You can find an overview of interviews and reviews for the new Star One album here. We’ve just posted the official trailer for the new Star One album, “Victims of the Modern Age.” You can watch it here: http://www.youtube.com/watch?v=yzraGq2jDIM. Starting today you can order signed copies of the Limited 2-CD Mediabook edition of the new Star One album "Victims of the Modern Age" exclusively through the ArjenLucassen store. SPECIAL PREORDER BUNDLE OFFER – Ltd. Edition 2-CD plus SHIRT! Orders will ship in the last week of October. All BUNDLE orders to non-European countries will ship registered priority mail to ensure the fastest and safest shipping. If you have any questions about the signed pre-sales, just email Lori [store AT arjenlucassen DOT com] who will be happy to help you. Now that we’re finished with all the "Guess the Movie" contests, we can finally reveal the track list! Congratulations to HARKONNEN, the lucky winner of the final "Guess the Movie" contest. The lyrics sung by the beautiful and talented FLOOR JANSEN in this video clip http://www.youtube.com/watch?v=Ghz6cdop9uw were indeed inspired by the Terry Gilliam film, "12 Monkeys." Congratulations "Highfire" (from Spain ), who will receive a free copy of Victims of the Modern Age for being the lucky winner drawn from those who correctly guessed "Escape from New York" as the movie that inspired Arjen’s lyrics in this video clip: http://www.youtube.com/watch?v=ePeAQicUY_4. All of the songs on Victims of the Modern Age were inspired by various dystopian and post-apocalyptic movies that have made an impression on Arjen over the years. In the Youtube video linked to below, you’ll hear FLOOR JANSEN singing part of one of the tracks from Victims of the Modern Age. Your task is to guess the movie that inspired Arjen’s lyrics. Only answers posted in the official contest thread count. You do NOT need to create a user account to participate. Guest users can to post in the contest thread during the contest. The contest is OPEN FOR 24 HOURS. One winner will be selected at random from among those who have posted the correct answer. ONLY YOUR FIRST GUESS COUNTS, and you can only guess ONE MOVIE per post (no lists) so make sure to think carefully before you post your guess! The winner will receive a free copy of Victims of the Modern Age. Make sure you post some kind of contact information so we can notify you if you win. Signed pre-orders of the “Victims of the Modern Age” special 2-CD edition will be available exclusively from the ArjenLucassen store. Look for an update TOMORROW about how you can order. Best wishes from all of us at ArjenLucassen.com until next time! Congratulations Tony (from the USA), who will receive a free copy of Victims of the Modern Age for being the lucky winner drawn from those who correctly guessed "Planet of the Apes" as the movie that inspired Arjen’s lyrics in this video clip: http://www.youtube.com/watch?v=FasLjzvTEVc. All of the songs on Victims of the Modern Age were inspired by various dystopian and post-apocalyptic movies that have made an impression on Arjen over the years. In the Youtube video linked to below, you’ll hear DAMIAN WILSON singing part of one of the tracks from Victims of the Modern Age. Your task is to guess the movie that inspired Arjen’s lyrics. Signed pre-orders of the “Victims of the Modern Age” special 2CD edition will be available from early next week exclusively from the ArjenLucassen store. The details are still being finalized, but as soon as we’re good to go we’ll be getting back to you with all the details! Now you can hear a full song from the forthcoming Star One album “Victims of the Modern Age” on Noisecreep.com. The song is called “Earth that Was.” Enjoy! Congratulations to contest winner Andreas (from Norway), who will receive a free copy of Victims of the Modern Age for being the first to correctly identify "Logan’s Run" as the movie that inspired Arjen’s lyrics in this video clip. All of the songs on Victims of the Modern Age were inspired by various dystopian and post-apocalyptic movies that have made an impression on Arjen over the years. In the Youtube video linked to below, you’ll hear DAN SWANÖ singing part of one of the tracks from Victims of the Modern Age. Your task is to guess the movie that inspired Arjen’s lyrics. HOW TO PARTICIPATE – NEW RULES!! Congratulations to contest winner Basel, who will receive a free copy of Victims of the Modern Age for being the first to correctly identify "A Clockwork Orange" as the movie that inspired Arjen’s lyrics in this video clip: http://www.youtube.com/watch?v=FdSJsgfAHoE . All of the songs on Victims of the Modern Age were inspired by various dystopian and post-apocalyptic movies that have made an impression on Arjen over the years. In the Youtube video linked to below, you’ll hear ARJEN butchering singing part of one of the 5 tracks from CD2 (Special Edition only) of the album. Your task is to guess the movie that inspired Arjen’s lyrics. When you are ready to guess, go to Arjen’s Message board and post your guess in the official Contest 2 thread here: http://www.arjenlucassen.com/board/viewtopic.php?t=4440. Don’t forget to post your contact info so we can reach you if you win. You do not need a user account to participate. During the contest guest users can to post in the contest thread without creating an account. Only one guess is permitted per post. The first person to guess the title of the movie correctly wins a free copy of Victims of the Modern Age. Congratulations to contest winner Mario, who will receive a free copy of Victims of the Modern Age for being the first to correctly identify the mystery singer as TONY MARTIN (ex-Black Sabbath). Arjen has been a big fan of Tony Martin’s voice for a long time, and is proud to have him singing one of the 5 tracks that will appear on CD2 of the Special Edition. All of the songs on Victims of the Modern Age were inspired by various dystopian and post-apocalyptic movies that have made an impression on Arjen over the years. In the Youtube video linked to below, you’ll hear RUSSELL ALLEN singing part of a song from the album. Your task is to guess the movie that inspired Arjen’s lyrics. When you are ready to guess, go to Arjen’s Message board and post your guess in the official Contest 2 thread here. Don’t forget to post your contact info so we can reach you if you win. The Special Edition of Victims of the Modern Age includes a second CD featuring guest singers who are not part of the Star One line-up. In his latest video update, Arjen introduces two of them. But there is a third singer Arjen DOESN’T mention by name — in this first contest your task is to guess the identity of this mystery singer. When you are ready to guess, go to Arjen’s Message board and post your guess in the official Contest 1 thread here . Don’t forget to post your contact info so we can reach you if you win. For those who can’t watch the video, the two singers Arjen introduces are Rodney Blaze and Mike Andersson, who each sing one of the five extra tracks that appear on CD2 of the Special Edition version of the album. In his latest video update, Arjen reveals the instrumentalists for the new Star One album Victims of the Modern age. Arjen has just completed work on a new Star One album. The album is titled “Victims of the Modern Age” and is due for release in late October 2010. Watch the video below for a message from Arjen and a look at the cover artwork. Those who follow Arjen on Facebook, Myspace or Twitter have probably already heard that the Mastermind is hard at work on what will be a new STAR ONE album. The instrumental demos are completed, and Arjen is now working on lyrics and melody lines. Stay tuned for more! people on Arjen’s message board. It was an open invitation, although because of limitations of space, attendance was limited to the first few people who confirmed they could make it. The 9 attendees got to listen to the demos, munch on assorted goodies, and fill in feedback forms to catalog their reactions to the songs for Arjen. Keep in mind that they heard rough demos — no vocals, no solos — these are the first demos that Arjen puts together just to get the structure and feel of the songs down before starting serious work on lyrics and vocal melodies. We’ve just uploaded the full song Green and Cream, the third audio preview from "On This Perfect Day". The song clocks in at 10:32, and highlights the intricate drumming of Chris Maitland (ex-Porcupine Tree). You can find it on the Guilt Machine MySpace. We’ve also uploaded the booklet artwork and lyrics for the song here. If you’ve not preordered yet, it’s not too late to order your signed copy of "On This Perfect Day" from Mascot Records. Be advised that quantities of signed copies are limited! If you visit the Guilt Machine Myspace site, you can now see the four-minute video trailer for "On this Perfect day," featuring a medley of selected passages from 5 songs. The first reviews of "On This Perfect Day" have been really positive. In fact, we’re pleased to report that the album came in on top of the Aardschok magazine soundcheck, thus becoming the album of the month for the August/Sept issue. Photographer Jasper van Tilburgh shot the cover and article photos — thanks Jasper! Pre-order "On This Perfect Day"
Thanks to all of you who have already pre-ordered the album. Mascot tells us that the pre-orders are going great! If you’ve not preordered yet, you can still order your signed copy of "On This Perfect Day" from Mascot Records. In our next newsletter we’ll be presenting a third song in its entirety, so stay tuned! 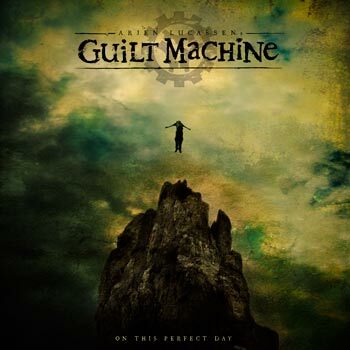 If you visit the new Guilt Machine Myspace site, you can listen to the second song from the forthcoming Guilt Machine album "On this Perfect Day". We’ve uploaded the 11-minute song "Perfection?" in three parts. Thanks to everyone who’s already preordered copies of "On This Perfect Day." If you’ve not preordered yet, you can still order your copy from Mascot Records. Our next newsletter will contain a link to the Guilt Machine promotional trailer, so stay tuned! Guilt Machine audio samples posted! If you visit the new Guilt Machine Myspace site, you can listen to the first song from the forthcoming Guilt Machine album "On this Perfect Day". We’ve uploaded the 12-minute song "Twisted Coil" in three parts. Germany, Austria and Switzerland — 28 August. Rest of Europe — 31 August. 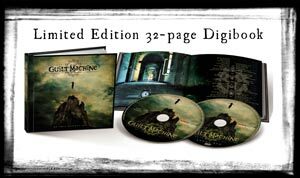 Guilt Machine album preorders start now! Preorders for the Limited and Special Editions of "On This Perfect Day" have begun, and are being handled by Mascot Records directly. Preorders will be shipped near the release date, and (depending upon your country of residence) should arrive during the week of release (31 August). All pre-ordered copies will be signed by Arjen Lucassen, Jasper Steverlinck & Lori Linstruth. Paypal is the only method of payment accepted. Our next update will contain a link to another song sample, so stay tuned! Next week’s newsletter will contain pre-order information and…. links to the first audio samples, so stay tuned! We’re pleased to announce that Arjen’s new project, Guilt Machine, will be released by Mascot Records. The photo at right shows Arjen and Mascot’s Ed van Zijl formalizing the happy arrangement by signing the contracts. The release date will be announced in a later update. We would like to formally thank everyone who submitted an audio message to the Guilt Machine project. Your response to our announcement was overwhelming! We received over 200 messages, far more than we could possibly use on the album. In the end, 19 messages were included on the album, either in between the songs or within the songs themselves. The messages — in languages ranging from Chinese to Tagalog to French to Russian — add just the extra personal touch that we were looking for. Because we know how disappointing it must have been for those whose messages weren’t chosen, Arjen has put together an 8-plus-minute instrumental bonus track filled from beginning to end with as many messages as possible. Even then there wasn’t room for all of the messages (that would have required a much longer song), but we’ve done our best to choose messages from as many people as possible. Stay tuned in the coming weeks for music previews and other updates about Guilt Machine! The deadline for submitting messages to the Guilt Machine project is now over, and the finalists who provided an email address have been notified. In the end we received far more messages than we expected, and it was extremely difficult to make the final selections. We were touched by the amount of thought and effort many of you put into composing your messages; whether or not your messages was chosen, thanks very much for taking the time to participate. We’re pleased to announce your chance to submit your own personal material for possible inclusion in Arjen’s new project, Guilt Machine. The songs of Guilt Machine center around the themes of guilt and regret: guilt for past wrongs (real or imagined) and regret for words unspoken and deeds undone. some way to record and send us your message (we give several options on the website). Note that we can’t possibly use all submissions, but will be choosing the strongest ones from among those we receive. The deadline for submissions is Sunday, 15 March 2009, at midnight Central European Time. If you have questions about recording your message or how to participate, please refer first hand to this topic on Arjen’s forum, where many questions have already been answered. There’s not been much news from us lately, but don’t let that fool you. There has been a bustle of feverish activity going on behind the scenes here at the Electric Castle. With this update from ArjenLucassen.com we’re excited to officially announce the details of Arjen’s new project, Guilt Machine. How did Arjen get an alternative rock vocalist to switch genres and sing on a prog rock project? "In the beginning it was hard to convince Jasper to sing on this album, because he comes from a completely different musical background. He didn’t even know what prog was, but we’ve made a believer out of him! What I admire about Jasper’s voice, besides its beautiful clear timbre, is the emotion and credibility he puts into his performance and his enormous range. Because this project features just one singer I needed someone versatile enough to portray all of the different moods, and Jasper didn’t disappoint. And he’s a really nice and dedicated guy as well!" For Guilt Machine Arjen also chose to record with a different drummer, Chris Maitland (ex Porcupine Tree). "Chris was the ideal choice this time, having both the power for the heavy sections and the subtle touch needed in the more atmospheric parts." Rather than the explicit storyline you would expect in an Ayreon release, the songs of Guilt Machine revolve around a central theme. Instead of looking outward into a world of fantasy or science fiction, the songs look inward, exploring the destructive psychology of guilt, regret and the darkest form of secret — the secrets we hide from ourselves. "At first I asked my partner and personal manager Lori to quickly write scratch lyrics for one of the songs so I could record some guide vocals. I was so impressed by what she produced that I asked her to write the lyrics for all the songs. I was unable myself to create the type of darkly enigmatic, open-ended lyrics I wanted for these songs, my specialty being sci-fi lyrics about sinister aliens 😉 She definitely gave the songs an extra dimension with her lyrics, exorcising the demons we both had faced in the past few years. It’s also no secret that I’ve always been a big fan of her melodic guitar style, so she also plays all the guitar solos on this album." Despite these differences, Guilt Machine still has much in common with Ayreon. The songs are mainly long, "epic" tracks that feature dynamic contrasts between softer, dreamy sections and powerful, heavy passages. There are intricate harmonies, complex rhythms, soaring melodies, and an eclectic selection of instruments — all what you’d expect from an Ayreon release. "In my view this is my best side project so far. It comes completely from the heart, for it was written and recorded during a new inspiring phase in my life after my heavy depression. This being an entirely new project there were no expectations whatsoever, which enabled me to just let my inspiration guide me without any (outside) pressure." It’s time again for the Ayreon Fanmeet! Just like last year, a group of Arjen’s fans in the Netherlands have organized a special meeting for Ayreon fans. Tickets: 10 Euro – available here. The Ayreon Fanmeet on October 11 is being arranged by and for people that admire Ayreon and Arjen’s other projects. Together we want to have a marvellous day with (live) music related to Arjen. This year’s event features performances by the bands Galanor (www.galanor.com) and LadyLau (www.ladylau.com). Both bands will be playing Ayreon songs in addition to their own music. LadyLau and members of Galanor were part of The Ayreonotes, a band formed by musically talented fans for last year’s fanmeet. Besides the live music, the fanmeet offers a chance for Ayreon fans to meet and mingle. There will also be a few special guests (musicians that have played on one or more of Arjen’s albums). You can talk to them and they’ll bring their merchandise as well. Tickets are 10 Euro each. Fanmeet visiors attending the Alquin (www.alquin.org) concert later that evening will receive a 5 euro discount on their Alquin ticket! For fanmeet tickets and all the latest info, please visit www.ayreonfanmeet.com. And feel free to contact us if you have any questions. All together it will be a great day for anyone who likes Arjen’s music; hope to see you there! The latest news from the Electric Castle is that Arjen has just put the finishing touches on the forthcoming Ayreon 3CD + DVD compilation album, TIMELINE. "I’ve been asked many times before to release an Ayreon compilation album, but it just didn’t feel right to present fragmented bits of story by lifting individual songs out of their greater contexts. However, my attitude changed after I completed my 2008 album 01011001, in which I connected all the previous Ayreon releases, musically as well as lyrically. Having completed the circle, so to speak, it seemed like a fitting time to put all things Ayreon into perspective and create an Ayreon timeline outlining the entire story." 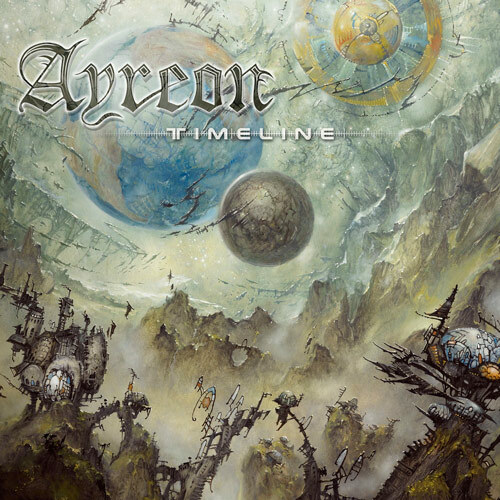 TIMELINE follows the thirteen-year evolution of the Ayreon sound from the 1995 debut The Final Experiment to the release of 01011001 in 2008. In addition to selecting tracks from the existing Ayreon discography, Arjen has also written and recorded a new Ayreon song exclusively for TIMELINE. Titled Epilogue: The Memory Remains, this previously unreleased 9-plus-minute track introduces Ayreon fans to the clear, powerful voice of Jasper Steverlinck (Arid). Lyrically, The Memory Remains provides further insight into the final chapter of the Ayreon saga and what the future might hold for its characters. In addition to The Memory Remains, TIMELINE’s 3 audio CDs comprise 32 essential Ayreon tracks (almost 4 hours of music), all carefully remastered specifically for this release. The accompanying DVD features nearly two hours of released and unreleased video clips, behind-the-scenes featurettes, 5.1 mixes, and live performances of Ayreon tracks (Star one and Stream of Passion versions). To illuminate the Ayreon story further, a timeline poster illustrating the Ayreon universe and 56-page booklet containing many new photos, all lyrics, and notes on the story are included in the TIMELINE package. 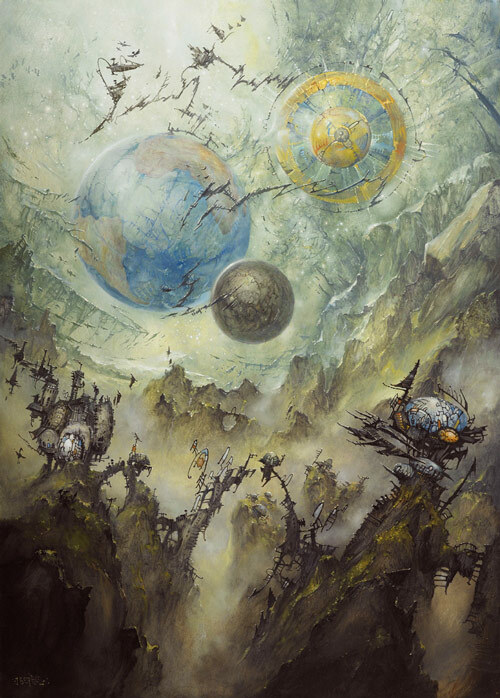 The cover is a specially commissioned painting by traditional Ayreon cover artist, Jef Bertels (see the full painting here). TIMELINE will be available from InsideOut Music on 7 November 2008 (G.A.S), 17 November 2008 (Europe), and 13 January 2009 (N. America). When asked what the release of TIMELINE means for the future of Ayreon, Arjen explains, "I don’t see this as the end of Ayreon, but rather as a new beginning. I’ll definitely be recording some side projects before I even start thinking about re-inventing Ayreon. To keep things fresh for myself I’ve got to come up with a completely new concept for both the music and the lyrics. I hope I can do it…it will be definitely be quite a challenge!" Ask Arjen Anything – and get answers! Every so often we collect all the weird and wonderful questions that Arjen’s fans can come up with in an event called “Ask Arjen Anything” (AAA). The results of the most recent AAA are posted online now on the Message Board and on the blog. Enjoy! We’ve just uploaded 4 videos from the 01011001 release party that took place in Utrecht on 27 January, 2008. Now you can relive the experience (or find out what you missed)! The videos, “Release Party Overview,” “Charm of the Seer,” “E=mc2,” and “Day 6: Childhood,” were filmed and edited by the ace crew at D’iMages. We’ve just posted some audio samples from the new Ayreon EP Elected. Ayreon vs. Avantasia – new EP! Press Release: AYREON VS. AVANTASIA! Ayreon releases EP featuring 3 non-album tracks. On January 25, 2008 the rock operas of Arjen Lucassen and Tobias Sammet, respectively Ayreon’s 01011001 and Avantasia’s The Scarecrow, were released simultaneously. The music press, always eager for a story, called this event the ‘Clash of the Titans’, gleefully portraying the two musicians as bitter rivals and urging each to comment on the other in countless interviews. There was much speculation about which album would be more successful, but upon release both albums immediately charted in several countries around the world. When asked about the so-called rivalry, Arjen explains: “I’d not yet even heard Tobias’s album, but when I found out he’d managed to get my all-time favourite artist Alice Cooper to guest on The Scarecrow, I totally freaked out and sent a hate-mail to Tobias’s MySpace. Fortunately, he never received it”. Coincidentally however, Tobias, who was fed up with having to talk about Arjen in interviews, grudgingly decided it was time to get acquainted. He emailed Arjen, and in the stream of email and insults that followed “it turned out that Tobias hated me just as much for having got Bruce Dickinson to guest on an Ayreon album, haha!” Arjen explains. Despite their mutual hatred, the two musicians eventually hatched a plan to put some fuel on the fire created by the press by doing the unthinkable: recording a song together. The result is a mind-blowing over-the-top cover version of Elected, the original version of which was a big hit for Alice Cooper back in 1973. We’ve just received confirmation that Arjen will be making at least two in-store appearances this month. Joining him for a short acoustic set will be vocalist Marjan Welman, whose powerful vocals are featured on the song E=mc2 on 01011001. Admission to the in-store performances is free. A new preview video of 01011001 has been posted on Arjen’s MySpace, featuring a glimpse into the studio and previews of the songs — don’t miss it! You can watch the CGI movie for Beneath the Waves from 01011001 here. Happy New Year! Each day until January 1, 2008 we’ll be unveiling selected album artwork from 01011001. The first previews, created by Simon van Vegten of DPI Animation House, are already up and available here. You can listen to the track ‘The Fifth Extinction’ taken from the forthcoming Ayreon album ‘01011001’ on Arjen’s MySpace. The track is divided up in two parts to meet with MySpace limitations (the song is just over 10 minutes long). You can download banners to promote the new Ayreon everywhere. You can download the teaser trailer for 01011001 at this location (right-click and save). Or visit MySpace. Here follows a statement from Y. Boertje, Personal Manager for Arjen Lucassen: “After working for Arjen for as a manager for nearly five years, I decided it was time to move on and, among other things, pursue my screenwriting career. Signed editions of 01011001 are now available for pre-order through the Plato.nl store. Please check the pre-order page here for information. The new Ayreon album will be released in Asia (Japan, China, Korea, Thailand, Vietnam, Indonesia and other territories) through Avalon/Marquee Records on January 23rd, 2008. It will be the regular 2 CD edition containing two Arjen guide vocal bonus tracks, plus one exclusive Arjen guide vocal track. For all release dates please visit the 01011001 page. To celebrate the newest Ayreon release, we’ll be throwing a party for the fans. The location is (like The Human Equation Pre-Release Party) in the Stairway to Heaven Cafe in Utrecht, The Netherlands on Sunday January 27th, 2008. It’s a free event which it starts at 13.00 hrs and should end at about 17.00 hrs. You will also be able to buy all editions of the album and new merchandise. More information will become available soon. Mark your calendars and we hope to see you there! – A regular 2CD edition with a 28 page booklet. release dates and all official information. Belgian painter Jef Bertels once again provided the cover for the new Ayreon release named “01011001”. Jef previously made paintings for the Ayreon albums Into the Electric Castle, The Dream Sequencer and Ayreon’s latest release The Human Equation. You can check out more of Bertels wonderful world at his official site. For the lay-out artwork (the images inside the booklet) Arjen has called in the talents of Colombian graphics artist Felipe Machado Franco. You can check out his website at this location. Please check the 01011001 page for all official information. Other territories & labels TBA. The full track list for the new Ayreon double disc release has been announced. Please check the 01011001 page for all information. The album is now finished and will be in stores end of January 2008. Please check the 01011001 page for exact release dates. Beside guest guitarists, Arjen also invited keyboard players for the new Ayreon album. They are (in order of appearance) Derek Sherinian (Planet X), Tomas Bodin (The Flower Kings) and Joost van den Broek (After Forever). Check the link hear to the Three Guest Keyboardists. Flutist Jeroen Goossens of the Dutch folk band Flairck returns to Ayreon. Jeroen who previously played on Ayreon’s The Human Equation and starred in the “Loser” video, recently recorded his parts in the Electric Castle. Other instrumentalists we previously announced include Ben Mathot of the band Dis on violin, David Faber on cello and of course Gorefest’s drummer Ed Warby. The following three guitarists play solos on the new Ayreon album called 01011001: Lori Linstruth, Arjen Lucassen himself, and Michael Romeo. Stay tuned for more guessing when we give you a sample of the guest keyboardists! We’re now able to reveal the title for the new Ayreon album due out in January 2008. It is called 01011001. You can check all official information such as sound clips and future downloads by visiting the special 01011001 page. about Pain of Salvation you can check their website. For the past few years Arjen has made it a point to invite relatively unknown vocalists to sing along with the more well known artists. Arjen chose these two Dutch singers because, as he puts it: “…they are very talented, they have charisma and they possess the drive needed to make it quite far in the music business”. Vocalist number 15 is Wudstik, a Dutch hip hop and soul artist. Now don’t run away, he actually loves rock as well! In fact his favorite bands include Dream Theater, Symphony X, Spock’s Beard and Pain of Salvation. And obviously… Ayreon. He has made one album and appeared on Dutch TV (Raymann is laat). Check out Wudstik’s official site or his MySpace for more information on this up and coming artist. Marjan Welman of the band Elister sent in a demo of her voice many years ago, and once again after her successful appearance in the Stream of Passion cover act “Team of Passion”. Arjen’s attention was drawn and he eventually invited her to sing a part on the new Ayreon. Marjan is an active messageboard member, and her band Elister opened for Stream of Passion for their concert in Rijssen earlier this year. Check out Marjan’s MySpace or Elister’s MySpace for more information. drove to the Electric Castle last Tuesday and got horribly stuck in traffic! However, he did make it to the studio eventually and recorded vocals for the new Ayreon album. You can find out more about Hansi on Blind Guardian’s official website and MySpace. Frontman Steve Lee from the multi-platinum-selling Swiss band Gotthard has been announced as the 13th vocalist for the new Ayreon album. Steve once auditioned to be the new singer for Vengeance, and 18 years later they met up again. Check out Gotthard’s official site and MySpace for more information. Gotthard is currently on tour in Japan and Russia. September 15th saw the birth of what may become a tradition: the very first Ayreon Fan Meet. Fans from across the globe, who spend a lot of their time on the Ayreon messageboard, planned to meet up in what once was to be a simple lunch meeting in the Amsterdam Zoo. The plan steadily grew into an official meeting. The coverband Ayreonotes, featuring members of the messageboard, did an excellent job on Ayreon and Star One classics such as Castle Hall, Isis and Osiris, The Eye of Ra and High Moon. Special guests attending were Ian Parry, Ruud Houweling, Peter Vink and the tall minstrel himself Arjen Lucassen. You can read reports and check out pictures on the Ayreon messageboard. Floor Jansen and Phideaux announced! Right before she left on an extensive tour with her band After Forever, Floor Jansen joined Arjen once again in the Electric Castle to record vocal parts for the new Ayreon. You can check out all about Floor on her official MySpace and also on After Forever’s website.Another vocalists Phideaux Xavier recorded his vocals for the new Ayreon in the U.S. Arjen discovered his music a while ago, only to find that he was also a member of the Ayreon Yahoo Groups. Check out his website and MySpace for more information on Phideaux. Magnum’s legendary frontman Bob Catley flew in from England to sing at the Electric Castle for the upcoming Ayreon album. You can check out all about Bob on his official MySpace and website. Check out Magnum’s official site as well, for upcoming tour dates. Jonas P. Renkse on Ayreon! Hailing from Sweden Jonas P. Renkse of the band Katatonia joined Arjen in the studio just a few days ago. Beside doing his trademark intimate vocal parts, he also laid down a few growl tracks for the new Ayreon, eventhough he hadn’t growled on record for about 12 years. Check out Katatonia’s official MySpace site, and their official website for more information. Now that wasn’t so hard for most of the guessers on our messageboard and among our MySpace friends! Jorn Lande is the eighth vocalist to be announced for Ayreon. Although there are some of you who haven’t heard this fantastic vocalist who flew in from Norway to sing at the Electric Castle. If you want to know more about Jorn Lande, do check out his official MySpace site, and his official website for more information. Tom Englund is vocalist number 6! expected. But eventually someone figured it out. And be sure to check out Dial’s MySpace page as well. Ayreon album is none other than Ty Tabor (King’s X). Ty recorded his vocalist in his own Alien Beans Studio. Thirteen vocalists have been confirmed, with more to be added. The second vocalist that recorded vocals in the Electric Castle has officially been confirmed to be Simone Simons of the Dutch metal band Epica. There were some good guesses as to who the vocalist was on the sound sample that we put up a while ago. A few even got it right: the first vocalist who will star on the new Ayreon is Magali Luyten (Virus IV and Beautiful Sin). Twelve vocalists have been confirmed so far, with a number of vocalists still to be added over the next few weeks. A few more recording dates have been set, so keep tuned. Though Arjen initially planned to release a single album, the plan — as always — changed as the composing progressed. Like ‘The Human Equation‘ and ‘Into the Electric Castle‘, the new Ayreon will be a double album featuring 15 tracks with a combined length of nearly 100 minutes. Arjen and Ayreon-veteran Ed Warby (Gorefest) will enter the studio next month to record drums together with producer Gordon Groothedde. to be quite a puzzle to figure out who will be singing where and what. for special updates and upcoming previews. Available now: a brand new exclusive interview with Arjen, in which he talks candidly about the difficult past few months, the future of Stream of Passion and some of his plans for the new Ayreon album. 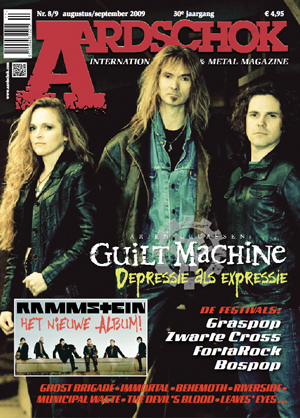 The leading music industry magazine MusicMaker (Dutch) features a 6-page article on Arjen Lucassen, available in stores now. Arjen is also on the cover. Another UK date has been added to the Stream of Passion feat. Ayreon tour roster. Stream of Passion DVD release in Brasil! Finally, we are able to bring you some news about Arjen’s next recording project. on for the past year. Ayreon/Stream of Passion/Arjen fans, and posed them to Arjen in this Ask-Arjen-Anything Questionnaire.